Electric Dog Fence Wire - What Is The Best wire for Invisible Dog Containment? Simply Tell us bit about your dog and what's been happening. Our boundary wires will not break down under the sun for a long time because of our UV Rated HDPe Coating, which saves you money compared to other PVC wires that may need to be replaced after a short amount of time. Low quality and thin wire does not offer you a good base for the signal and can lead to Radio Signal Bounce. Wire damage and broken wire are the biggest cause of concern for Invisible Dog Fence owners. We use an FM frequency so you can also have our wire on a metal colorbond fencing and near metal sheds. Our Dog Fence Wire is made up of 7 strands of 1mm copper wiring as its core. Having a multiple thick copper core ensures that the wire we are providing are strong and durable. This also gives the FM radio frequency signal a sufficient pathway to travel on. Our wire has 2mm thick High-Density Polyethylene(HDPe) Coating that protects it from light to medium damage. Not only that, it also helps prevent our invisible dog fence wire from breaking down in the Australian sun. This ensures that our Dog Fence Wire will last and will keep your dog sufficiently protected for several years. Does our dog fence wire need to be buried? No. Our wire is not just UV stabilized but its UV rated. You do not need to bury the wire anymore. Just leave it hanging on your fence. Our electric dog fence wire is protected from the unforgiving UV rays of the sun for 20 years. 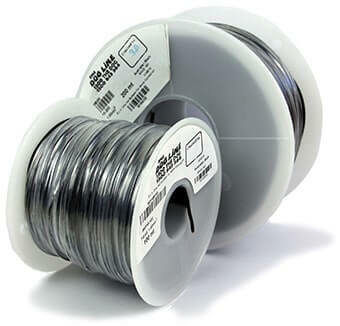 You do not want to get wire that will easily get damaged or baked by the sun's heat and UV rays. What happens when you get a wire break? A wire break almost always causes headaches on the dog owners like you. Once the wire breaks for whatever reason, you would have to go through a whole roll of inconvenience. 1. Your time is consumed - it takes hours of testing and detecting where the break is. 2. You Incur Additional Expenses - repairs or replacement always entail a cost even how small it is, it will affect your budget.